HONG KONG, Dec 3, 2015 - (ACN Newswire) - The 11th HKTDC InnoDesignTech Expo (IDT Expo) opened today at the Hong Kong Convention and Exhibition Centre (HKCEC). The three-day (3-5 December) fair, organised by the Hong Kong Trade Development Council (HKTDC), welcomes a record of more than 430 exhibitors from 19 countries and regions. Showcasing global creativity, the latest inventions, practical solutions and an assortment of commercial design services under one roof, the IDT Expo encourages businesses to enhance competitiveness and explore new opportunities through innovation and applied technology. "Applying design and technology to products and services is the most effective way to add value," said Raymond Yip, Deputy Executive Director of the HKTDC. "With the rapid development of technology, all industries must adapt to changing conditions and move towards higher value-adding activities to boost competitiveness. This year's IDT Expo has expanded its technology offerings, with exhibitors showcasing the latest applied technology solutions, including 3D printing, digital and interactive marketing and apps solutions." Two thematic halls are set up at this year's IDT Expo; Trade Hall and Inspiration Hall. At the Trade Hall, multiple exhibition zones showcase design- and tech-related solutions to help businesses upgrade and transform their operations. The solutions on show encompass product design, brand promotion strategy, new media promotion and technology applications. 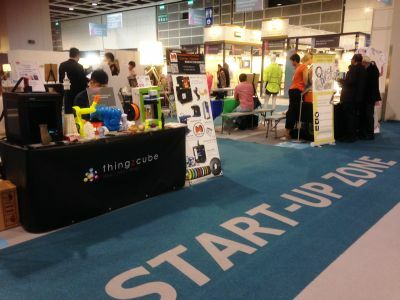 The Creative and Tech Start-up Zone, launched last year, provides a platform for start-ups to network with investors, entrepreneurs and potential partners. Building on last year's success, 100 start-ups from around the world have joined the zone this year. They include incubatees from the Hong Kong Science and Technology Parks Corporation, InnoCentre, Cyberport, Hong Kong tertiary institutions, iStartup@HK and a number of local co-working spaces. Overseas start-ups come from the UAE, Czech Republic, Israel, Malaysia and Mexico. The UAE and Mexico have also organised start-ups pavilions at the event for the first time. Among the start-ups presenting their innovative products and services at the fair is MAD Glass, which is a "smart" glass with smartphone functions that can play media, use GPS navigation, take photos or record videos. From Malaysia, Glueck Technologies' innovative facial recognition technology and big data marketing solutions are on display. Also in the Trade Hall, the Global Invention Zone showcases the creations of more than 120 inventors from Italy, Japan, Korea, Russia, Spain, Taiwan and Hong Kong. The inventions are exhibited under the themes of "Innovative Technology", "Medical & Healthcare", "Smart Home & Building" and "Eco & Better Living". In the Inspiration Hall, exceptional projects by top Hong Kong and international designers are on show. Barcelona, this year's partner city of the IDT Expo, brings its creative flair to the event under the theme "Barcelona Inspires Design". Leading Barcelona brands including FCBarcelona, MANGO, Roca and TOUS are hosting a series of events such as seminars and product demos to show how innovation and creativity can be applied in commercial sectors including vehicles, fashion and social infrastructure. Representatives from Barcelona and Hong Kong's creative industries will also exchange insights during seminars on such topics as eco-design, e-commerce and designing cities of the future. Apart from Barcelona, the Expo also showcases unique creations from other countries and regions, including the "Washitsu" designs by Japan's Kyoto Design Association. Meanwhile, the Australian design pavilion demonstrates the country's lifestyle and cultural design. The number of Hong Kong designers featured at this year's Inspiration Hall is the largest in recent years. Among the projects on display are Hong Kong Interior Design Association's "10cc - Hong Kong Spirit" showcasing chair designs and "Urban Oasis" showing design blueprints created by a number of local young designers. "Design without Boundaries" campaign features iconic design exhibits created by nine renowned international designers who are based in Hong Kong, such as Michael Young, Katarina Ivarsson from Boris Design Studio and Johan Persson from C'monde Studios. Seven of them will join the sharing session to discuss their design concept and their creative journey in Hong Kong. Moreover, PHILIPS has joined hands with City Magazine to debut "A Journey of Innovation" multimedia installation; Tumblr's local "Creatr Hub" apps platform with 20 local illustrators, photographers, writers and artists' drawings, encouraging young design talents to take off. Create Hong Kong (CreateHK) of the Government of the Hong Kong Special Administrative Region* is once again sponsoring the Hong Kong Creative Force Zone in the Inspiration Hall. The Zone showcases more than 100 outstanding local creations, including those from "CREATE OUTSIDE THE GRID", a cross-discipline collaborative project between the HKTDC and 29 young Hong Kong designers. Exhibits include innovative lifestyle items crafted from reclaimed bamboo scaffolding and lamp wood. Also exhibited in the Inspiration Hall are the latest fashion designs from HKTDC's FASHIONALLY, success stories in "transformation and upgrading" and new media marketing solutions. The Hall is open to the public free of charge, to arouse the public's interest in design and technology. A series of talks and seminars are taking place during the IDT Expo, where experts in the fields of innovation and design from Japan, Italy, Switzerland, Taiwan and Barcelona can exchange ideas and insights with Hong Kong's business leaders. The seminars are categorised under three tracks; the Creativity for Business Track focuses on such topics as brand strategy, e-commerce and design; the Innovation for Business Track spotlights smart manufacturing, smart retailing and big data for marketing; and the Creative & Tech Start-up Track addresses issues related to concept commercialisation and the business of design and innovation. The star-studded line-up of speakers includes: Luca Alessi, fourth-generation heir of Italian household products brand Alessi; Junko Gennami of Good Design Store; Xavier Carbonell of MANGO, Chair for Corporate Social Responsibility; Carlos Velazquez of Roca Group; Xavier Asensi of FCBarcelona HK; and creative expert Tommy Li. The Hong Kong Maker Club will organise a robot boxing contest on 5 December (Saturday) in the Inspiration Hall. The InnoDesignTech Expo is a part of the Innovation and Intellectual Property Week and is organised in parallel with the World SME Expo, Hong Kong International Franchising Show and Business of Intellectual Property Asia Forum at the HKCEC. Together, the events and activities address topics ranging from design and technology and starting a business, to brand promotion and IP management, providing a one-stop platform for SMEs to find value-adding business solutions. * Disclaimer for InnoDesignTech Expo: Create Hong Kong of the Government of the Hong Kong Special Administrative Region provides funding support to the project only, and does not otherwise take part in the project. Any opinions, findings, conclusions or recommendations expressed in these materials/events (or by members of the project team) are those of the project organizers only and do not reflect the views of the Government of the Hong Kong Special Administrative Region, the Communication and Creative Industries Branch of the Commerce and Economic Development Bureau, Create Hong Kong, the CreateSmart Initiative Secretariat or the CreateSmart Initiative Vetting Committee.